It was just supposed to be a little party to show 11W readers our appreciation. The Miami Hurricanes were coming to Columbus to play the Buckeyes for the first time since the greatest night of all time and we figured hey, why not host a tailgate? It was a great, warm-weather opportunity to see a few of the dozen or so faces on the other side of the Internet who had found and made elevenwarriors.com part of their daily routine. Looking back, we just wanted to drink some beers with you. 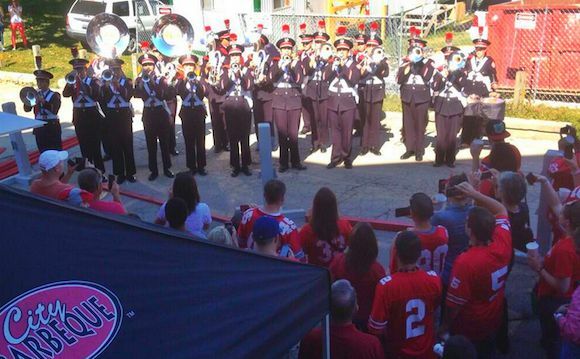 We had no idea that you would turn our annual tailgate - Eat Too, Brutus - into something far more noble. It was almost unnerving meeting actual people who were regular readers of 11W; a year earlier the site was only getting 4,000 clicks daily - which today is what an offseason Skull Session in the middle of summer already has before you've even had your first sip of coffee. We weren't sure anyone would show up, but a few dozen of you actually did. We were ecstatic. You exist. Eleven Warriors readers really exist. The tailgate was an unqualified success, and plans were laid to make an even better sequel. But we weren't exactly sure what it was going to look like. Looking back, we figured is was just going to be a slightly bigger little party for you guys. Eat Too, Brutus III: It had sponsors and everything. Cal Ripken Jr. collected 19 All-Star appearances and two AL MVPs over his Hall of Fame career. Most notably, he shattered the single American sports record previously deemed to be unbreakable: Lou Gehrig's consecutive-games played mark. Ripken was Major League Baseball's iron man. Lito Ramirez named his son after the Orioles legend. Cal is now six years old. He has already sustained six surgeries during his six years that have required general anesthesia. Cal has Down Syndrome, which puts him in a health category where he is impacted by more ailments than any six-year old should have. Two summers ago he had spinal cord surgery. Three months ago he had eye surgery. And there were all of those other painful, uncomfortable and terrifying surgeries in between. Every time Cal has a surgery he misses several weeks of school. Every time he misses several weeks of school, his path of academic progress is disrupted. Surgery also puts his childhood put on hold. And as challenging as it is, it's not as if Down Syndrome is some newly-discovered, emerging condition: The first clinical description for it was published in 1866, during the Reconstruction. That was 147 years ago, and medical science has not made any progress as to what happens at the genetic, protein or biological level to find its root cause. By comparison, the first clinical description for Cystic Fibrosis was published in 1938. In 1989 scientists discovered its responsible gene and there are now numerous gene therapies available for treatment. No such breakthrough for Down Syndrome exists. Yet. "The golden age for Down Syndrome research was 1959 to 1963," Lito said. "Dr. Jérôme Lejeune discovered the extra chromosome. In '62 British scientists discovered its variants and Mosaic Syndrome." "But then, up until 2000 (when scientists mapped out the 21st chromosome) there was nothing in between. Almost 40 years went by. Nothing." So Cal did not benefit from all that could have been done to advance understanding his disease before he was born. He's lived a very tough six years , and he will continue to fight for relative normalcy throughout his adolescence. And he will succeed. Cal may still be a little boy, but he's emerged from six major surgeries. Cal is Lito's little iron man. Following our first tailgate, Eleven Warriors partnered with the Stefanie Spielman Fund for Breast Cancer Research at The James Cancer Hospital and Solove Research Institute for the first sequel to Eat Too, Brutus. We figured if we could get you off of your computers to come drink a few beers with us, we should use the opportunity to do something for the greater good. We raised almost $6000 during that 2011 tailgate, which by basement blogger standards is close to a billion dollars (non-scientific estimate). And 11W delivered all of that money to the Spielman Fund, since the word proceeds doesn't apply to Eat Too, Brutus. Our time, labor, costs and expenses were all part of the donation. Too many charities today are marketing vehicles for overhead and administrative costs that ultimately produce a net contribution that is a very small fraction of what is raised. We weren't interested in that kind of charity. Eleven Warriors is a labor of love; therefore Eat Too, Brutus would align with our organizational mission. It wasn't just the writers and noble readers of 11W who gave, either: City Barbeque donated all of the food and labor for the event. Cheryl's Cookies sent hundreds of cookies. Columbus attorney Kevin Hampton, the founder of Schmoogate hosted our after-party and collected an additional $2000 for the cause. The Spielman Fund was thrilled with what we were able to do with regard to both the contribution as well as the level of awareness. Some of Ohio State's attorneys, however, were less thrilled - despite the event infringing on none of the university's trademarks and generating zero income - not even expenses - for Eleven Warriors. So we reluctantly had to end our relationship with the Spielman Fund after one event. We cut the check to The James and were back to having an annual little party that we wanted to turn into something far more noble. Hampton then called called me with an idea. "I've got a guy you need to meet," he said. "His name is Steve Shoemaker. Awesome guy. He has a little boy with Down Syndrome." Steve introduced us to Lito, and that was how Eleven Warriors first learned of DSAchieves, which became Eat Too, Brutus' new beneficiary. Lito's career began in Ohio government, where he was part of George Voinovich's administration. He was recruited to the Northlich Agency in Cincinnati that had acquired the Ohio State University Medical Center as a client. Lito called on The James and had transplantation, neurology and rehab being the major service lines in his portfolio. Around that time he learned he and his wife were expecting Cal, and that he would have Down Syndrome. Cal was born, and at four months the surgeries began: Open heart and lung surgery. Lito left his job to take care of his son. “That first year was very tough," Lito said. "His viability and survival were both in the balance. After we got out of the woods I started to do what parents of Down Syndrome children do – seek advocacy, support and services. Because of my involvement in government, I was drawn to what was familiar to me." Lito quickly learned of that 40-year stretch where literally nothing was done to advance the understanding of Down Syndrome. The National Institute of Health (NIH) had 236 research areas and Down Syndrome was 186th on its list. PEOPLE WITH DOWN SYNDROME HAVE PROTECTION AGAINST SOLID MASS TUMORS AS WELL AS A VERY LOW RATE OF HYPERTENSION. WE COULD ALL BENEFIT BY FIGURING OUT WHY THAT IS. "When you don’t have money for research, there’s no incentive for researchers to get into the field," Lito said. "There’s no funding for infrastructure to enable that job." "That’s when I decided to leverage my career in politics to do something that isn’t being done already. DSAchieves' goal is to build infrastructure so researchers can do their jobs. We consider ourselves a business, but unlike other non-profits our business is Down Syndrome." "We take effort and pains to view things in a very disciplined business-like manner. We look at the challenges and explore what we can do to solve a business problem." At the core of that business problem is the lack of a national BioBank for Down Syndrome. Or, we can now say, was: The check given to DSAchieves from Eleven Warriors in October has been directly applied to the outright purchase of the refrigeration unit that will serve as the Down Syndrome National BioBank at Nationwide Childrens Hospital. "BioBanks are nothing new and they’ve been around since the 1990s," Lito said. "Autism, cystic fibrosis, cancer, muscular dystrophy, even psoriasis all have one." "Down Syndrome has never had a BioBank. I really can’t fully express the gratitude that DSAchieves owes Eleven Warriors. This is one of the least-funded conditions at the NIH. Federal funding per person is roughly $45/head for a disease that affects one in 698 people. Compare that to Cystic Fibrosis, funded at $3000/head and affecting one in 3000." "The generous gift you, your readers and Eat Too, Brutus partners have given us goes to impact research in a very real way." The BioBank is a medical-grade refrigeration unit that can hold up to 80,000 tissue samples. It is a fundamental tool that all researchers need to advance from bench science to clinical trials to therapies to helping Down Syndrome patients live with their conditions. "Try to imagine Eleven Warriors without any readers [Ed: Ha, we've been there] writers and its vibrant community," Lito said. "Imagine Eat Too, Brutus without all of the people who make it happen. Without basic tools, there’s nothing. That's how Down Syndrome research languished from the Sixties until the turn of the century." "This is what DSAchieves aims to solve. We build coalitions with hospitals, researchers and parent-advocates." Just this month Harvard, Mass General, Nationwide Childrens, NIH and the Alzheimer's Association all had representatives in Columbus discussing the structure of the new Down Syndrome BioBank. ELEVEN WARRIORS READERS HELPED FUND THE ACQUISITION OF THE DOWN SYNDROME NATIONAL BIOBANK AT NATIONWIDE CHILDRENS. "The striking thing about it," Lito said, "is that these things really aren't that expensive. Just about $20,000 for the unit, which is now a reality in part because of Eleven Warriors. But what is required for more support going forward is funding the research, the DNA extraction kids, the samples and the database." Over a 3-5 year period those costs will run over a million dollars. This can't be funded on tailgates alone, but it's not as though there isn't an enormous financial benefit to Down Syndrome research either. "The functional benefit of research and how it leads to greater independence and a better quality of life is the payoff," Lito said. "Addressing the cognitive issues, congenital heart defects, obesity - just think of the cost savings if we could better manage those things." Understanding Down Syndrome doesn't just mean managing symptoms, either. Most people don't realize the health benefits that Down Syndrome patients have as part of their condition. "Down Syndrome patients are virtually immune to solid mass tumors," Lito said. "Think if we could probe that and see how that benefits the general population. Something is happening at the genetic level – think if we can look at that and see how that could help everyone else." "The National Cancer Institute isn’t looking at it. The James is making tremendous advancements into cancer research, but not within the context of how it might be impacted by learning more about Down Syndrome. It's all about funding and priority." "People with this condition have protection against solid mass tumors as well as a very low rate of hypertension. We could all benefit by figuring out and solving why that is." 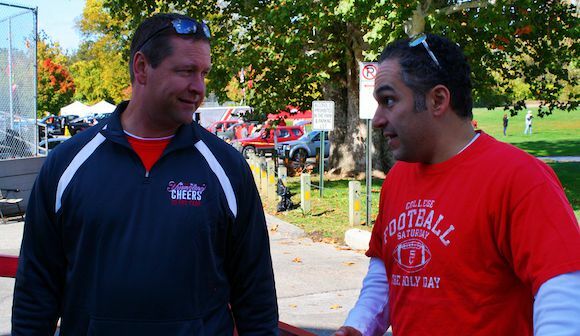 Steve Shoemaker and Ramzy Nasrallah preparing for Eat Too, Brutus III in 2012. Cal's eye surgery this past fall was hopefully the final medical event that will disrupt his schooling and childhood. Once those procedures are solidly in his rearview he can get on a normal path to progress. But that won't change his underlying condition. Having Down Syndrome means suffering from too many chronic illnesses. Cal will be more susceptible to congenital heart defects and Alzheimer's Disease - by the time he's 30. "It's a sobering fact as I look at my son,” Lito said. "Plaques and tangles (the pathological markers in the brains of Alzheimer's patients) can eventually start to grow in children as early as four months old. Cal already has those early pathological markers, and no one knows the trigger." "This is why the Alzheimer's Disease Association is interested in Down Syndrome research. Part of the BioBank has been set aside specifically to look into this aspect of the disease." Outside of trying to advance treatment for Down Syndrome, there has been plenty of ancillary progress. A pre-natal pin-prick on the finger can tell expectant mothers with near certainty if genetic defects are likely. The termination rate is almost 70% for parents who find out they’re expecting a child with Down Syndrome. In the Netherlands it’s nearly 100%. A Harvard study found that painful decision is rooted in the communication between the doctor and family. "(Parents) hear, 'your children won’t be toilet-trained until they’re 14, they'll in diapers until high school and then they will only do menial work' and that's just not all that inspiring," Lito said. "I know where (the high termination rate) comes from." The biggest debilitating factor for Down Syndrome patients is their inability to retain information. Information derived from the BioBank will be key to understanding and ultimately clearing this hurdle. "It takes foundation-building at this point," Lito said. "We’re basically starting at zero. The launch of this BioBank puts us on the path to progress." Aiding Down Syndrome patients by teaching them advanced skills leads to better-paying jobs, living more independently, more public acceptance and less reliance on public rolls. "It would be a huge benefit to help kids like Cal acquire a larger breadth of experience," Lito said. "This is not a zero-sum game. Nobody has to lose for all of us to gain." 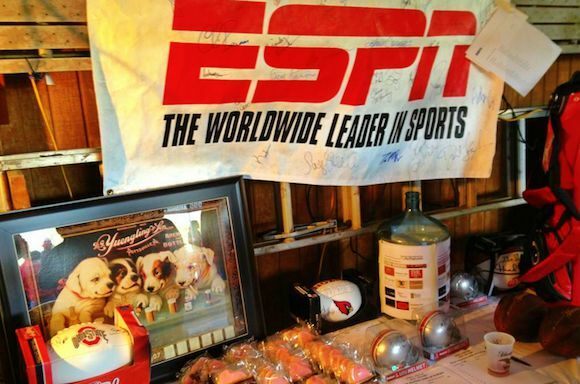 Anheuser-Busch and ESPN are among the generous sponsors who contribute to Eat Too, Brutus annually. The confluence of Eleven Warriors, Buckeye football Saturdays and the first-ever BioBank for Down Syndrome research is almost too strange to be true. Good intentions, an extremely visible platform, our vibrant community - and chance - led to it happening. But chance isn't going to produce advancements for people with or families affected by Down Syndrome. "At a Federal level, Cathy McMorris-Rodgers introduced significant legislation to help us, "Lito said. "Problem was, Congress never appropriated the money for it. Our BioBank is a private partnership with the government that is getting it done in the absence of public funding. We will connect it to the national registry." As unnerving as meeting actual people who were regular readers of 11W was all those years ago, it's even more unsettling to see how much more could be done to help kids like Cal, and families like Lito's. Eleven Warriors has grown to become one of the largest team sites of any kind over its seven-year existence. Along the way it has managed to impact lives in a way that we never really considered. In that sense, our annual tailgate is one of the proudest achievements we have - and our readers made it possible. So on behalf of everyone currently or formerly with Eleven Warriors - as well as DSAchieves - thank you for making Eat Too, Brutus what it has become. But looking back, we figured it was just going to be a slightly bigger little party for you guys. To learn more, get involved with or donate to DownSyndrome Achieves - click here.